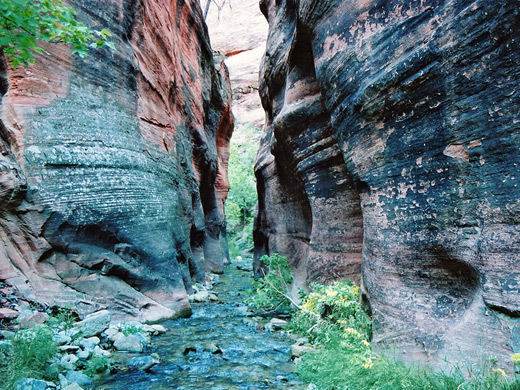 Kanarra Creek flows through a beautiful narrow red rock canyon that starts on the slopes of Kanarra Mountain, a few miles north of the Kolob Canyons area of Zion National Park, and exits the Hurricane Cliffs at the little town of Kanarraville. The Navajo sandstone formations are similar to those of Spring Creek a few miles to the south, but the gorge is deeper, the narrows more extensive and the scenery even prettier. 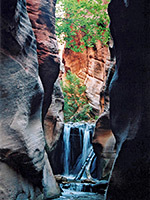 The stream carries a fair amount of water all year, especially in spring, so a hike up the canyon always involves extensive wading, and climbing past several waterfalls. The slot section extends for over a mile then gives way to a bright, tree-lined gorge which can be explored for several more miles. 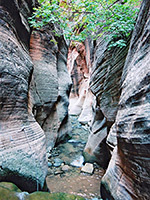 Kanarraville is 12 miles south of Cedar City, close to I-15. The trailhead for the hike up Kanarra Creek is reached by driving east along 100 North Street, a road which soon becomes a gravel track as it ascends quite steeply up the side of the cliffs, then bends right and passes over a small ridge, site of a water tank and some old buildings, giving nice views over the bushy, reddish hillsides to the east and the flatlands of the valley to the west. From here the track descends towards the creek and later crosses it twice, before ending close to the canyon mouth. In recent times the canyon has become very popular, with an estimated 40,000 people visiting per year (2016), on account of which the access track has been closed to public vehicles and the hike has to begin at the edge of town (parking fee $10), adding a quarter of a mile to the walk. Free parking is available along Main Street in the town center. Because of the increased popularity, and the need to protect the town's water supply, which comes from the creek, it may prove necessary to introduce a permit system to reduce visitor numbers. 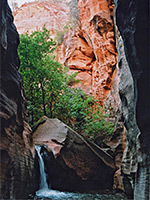 The canyon is a few miles outside Zion National Park, partly on BLM land, so as yet no permit is necessary. 15 views of Kanarra Creek. TopoQuest topographic map of Kanarra Creek. Beyond the end of the vehicle track, faint paths run through the undergrowth at either side of the stream for half a mile or so, until the cliffs rise quite high and the creek enters the first section of watery narrows, in which the water is usually just a few inches deep. The way ahead is soon blocked by the first of two main obstructions, a 15 foot high chokestone with 2 pairs of wedged logs providing climbing aids, made into a ladder by steps tied or nailed across. The ladders look sturdy enough but may be washed away or made unstable by strong floods. 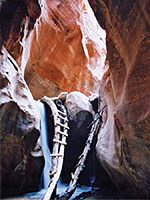 There may also be a rope fixed to the canyon wall to help the climb up. 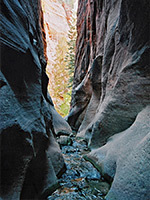 This part of the canyon has deep red walls, angular strata and overhangs higher up making the passageways rather dark, as little sunlight reaches the streambed. The gorge opens out for a while then narrows into a longer slot section containing a few boulders and pools up to 2 feet deep, and later a second large chokestone about 12 feet high, again with wedged logs and a rope, on the right side. Above here, and round a few bends, the canyon opens out once more allowing bushes and trees to grow alongside the gently flowing waters. A final narrow part with very sheer walls, up to 400 feet high, ends as the cliffs recede, and the stream winds uphill beneath gradually lessening cliffs. The walk to this point takes around 2 hours, and the whole canyon is very pretty and photogenic, just rather dark and gloomy in places.